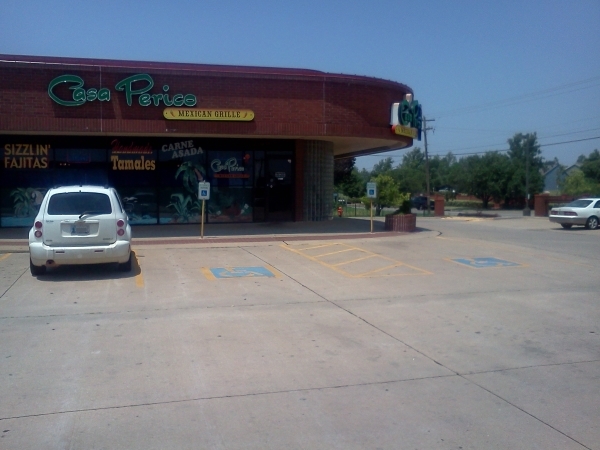 It’s not often I get to see great accessibility in a retro-fitted building, but Casa Perico is GRRRRRRREAT! The restaurant in on the corner of the Camelot Square strip mall. The disabled parking was fine – 2 spaces with one van accessible – but we arrived at pretty much high noon and both spaces were filled so we had to park in a normal spot. When we left at 1:00 pm, both spots were open. So plan a late lunch. The ramp was wide and had a natural slope into the sidewalk. VERY easy to navigate. The door was wide enough to allow entry without skinned knuckles. Already I’m a happy camper. Inside there were a few booths but mostly there were tables. And all the tables are accessible. Aisle space is sufficient IF everyone is scooted in at their tables. I missed it by an inch wheeling to the bathroom, but I just wasn’t looking. No humans were harmed in this endeavor, but I think my chair might have left a nick on the lady’s chair. And now to the bathroom. Wow! Firstly, the bathroom door as easy to open. Not one of those harder-to-open than-a-submarine-hatch doors. And the stall was roomy and the stall door had – drum roll please – a door knob with lock. A door knob! And I could reach it! I get so tired of those tapered twist locks that you cannot hold on to. A door knob! So listen up all you restaurateurs: it’s just not that hard to make a bathroom stall wheelchair friendly. Miscellany: TP reachable, grab bars in place, towels reachable, sink reachable. My only irritation was the drain, which was on the route from the stall to the sink. But it’s avoidable. One final note. A lot of restaurants use the bathroom hallway to store extra chairs and baby boosters. This restaurant had the stacks, but not in the pathway to the bathroom.